Planning a wedding or event can be a daunting process and people often don't know where to start. With that in mind, please see below for a selection of stunning venues and outstanding suppliers to assist you in the planning of your perfect day. 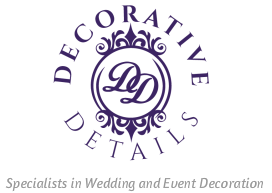 All of whom are highly recommended by Decorative Details. ​Glenfall House is a Grade II Listed Manor House in the Cotswolds, situated just 2 miles from the Regency spa town of Cheltenham. Set in over 4-acres of stunning gardens and grounds, this beautiful, family-run, 18th century country house has been lovingly restored to host luxury weddings, private events and celebrations. Tandem are an incredibly talented music duo comprised of Kelly (vocals) and Stuart (guitars) who have been performing their music to audiences around the world for the last 15 years. They are primarily an easy listening duo, providing sophisticated and relaxed music for weddings, events, corporate functions, restaurants, hotels and bars. Serving up great food is a surefire way to make your wedding or event a roaring success - done right, the food can set the scene for the rest of the day or evening and leave people talking about your event well beyond the occasion. From weddings, parties, anniversaries and celebrations, through to fundraisers, festivals and themed events, Cotswold Caterers can provide a fully customised culinary experience to suit any occasion.